At some point in time you may find you want to delete one (or several) of the pictures you have saved to your iVillage album. At some point in time you may get the message that you have no more room in your album and be forced to delete some whether you want to or not!!! At any rate....here is how you can do that. 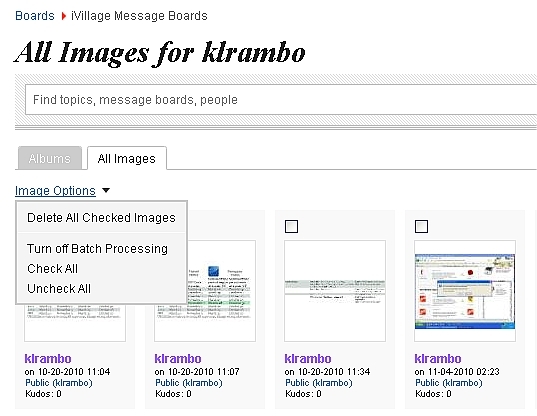 While on any iVillage board look at the upper, right side of board, in ‘Quick Links’ click on ‘Board Profile’. Find "View Images for yourname" anc click on that. On the left side of that page look for "All Images" and click on it. Now you have two options, depending on if you want to delete just a few or bunches of your pictures!! If only a few you can look through your pictures and hover your mouse cursor over the one(s) you want to delete (this will be a one at a time thing!) ~ you will see a ‘delete X’ appear in the lower right corner of the picture; click on it. Now you will be asked if you are sure you want to delete it ~ answer yes or no!! 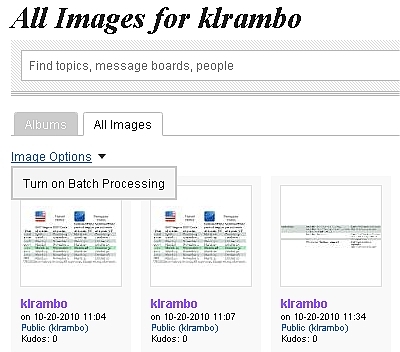 If you want to delete several hover your mouse cursor over the ‘Image Options’ and select ‘Batch Processing’. That will open a new page on which each image has a blank check-box. You may choose several by simply clicking on its check-box. Now, once again hover your mouse cursor over ‘Image Options’ and select "Delete All Checked Images". OR should you wish to delete *all* of your images you may skip the step of clicking on each of them and simply go to ‘Image Options’ and select ‘Choose All’ from the drop down box and then ‘Delete All Checked Images’! From there either check the ones you don't want or click on image options > check all. One more time click image options > delete all checked images.